TNGURU: 7th Pay Commission : Guess who else is going to benefit from Central Govt Employees' pay hike! 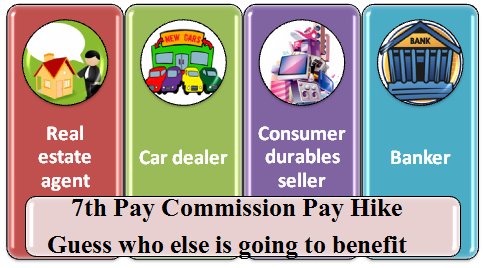 7th Pay Commission : Guess who else is going to benefit from Central Govt Employees' pay hike! 7th Pay Commission: Guess who else is going to benefit from central govt employees' pay hike! Banker: Of course, peaking demand for automobiles, real estate and consumer durable will create demand for consumer loans. The consumer loans section of banks and NBFCs will vie to get the larger share of the indirect gain from the 7th CPC salary hike. The scenario of crores of potential customers and falling interest rate will announce a win win situation for the banks and consumers both.